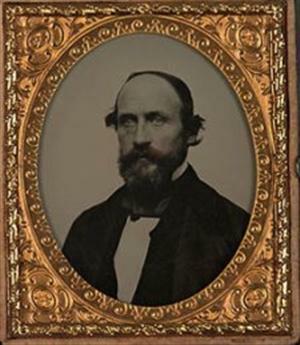 Charles L. Robinson was born in Massachusetts and after spending time in California during the gold rush, he would be chosen to lead the first group of Kansas settlers sponsored by the New England Emigrant Aid Company. Robinson would establish the company's headquarters in Lawrence, Kansas. Robinson soon became one of leaders of the free-state movement in Kansas. Robinson also would become involved in land speculation in the Kansas Territory. As a free-state leader, Robinson was a strong advocate for moderation, believing this would help the free-state movement in Washington, D.C. This would lead to a bitter rivalry with James H. Lane, who favored a more militant approach. Following the Topeka Constitutional Convention, Robinson was elected governor of the territory in the free-state elections held in January of 1856. Branded a revolutionary by the Pierce Administration in Washington and a traitor by the territorial legislature in Lecompton, Kansas, Robinson was arrested in the days following the Sack of Lawrence. He would be imprisoned at Camp Sackett a few miles southwest of Lecompton, Kansas. After the Franklin Administration agreed to drop the charges against Robinson and the other six free-state men, they were released in September 1856. In 1857, Robinson would lead the movement by free-state supporters to boycott the elections of delegates to the Lecompton Constitutional Convention. Later that year, Charles Robinson was arrested once again for usurping office. This time there was a trial, but Robinson was acquitted on August 20, 1857. When Kansas was admitted to the Union as the 34th State, Robinson would be elected its first Governor. As a result of his rivalry with Lane, he would later be impeached but would be acquitted at his trial.